Highlights, including Richard M. Nixon's entire 52 min. acceptance speech are covered by newsmen Chet Huntley, David Brinkley, Walter Cronkite, Edward R. Murrow, John Daly and Martin Agronsky from all three networks. Additional speeches are heard from Henry Cabot Lodge and from Nelson Rockefeller. In a memorable moment of television, we listen to Richard M. Nixon, who chats with shoe shine boy Leon Thompson. They talk about baseball and politics. Nixon introduces his daughter Tricia Nixon to Leon. Back in the NBC studios, Edwin Newman comments with a chuckle and signs off. The opening of the telecast is heard and a report on Gus Grissom's return from space. Walter Cronkite reports in the field. Walter Cronkite narrates the story of Takeo Yoshikawa, a Japanese spy, who relayed information from his post in Honolulu to his Navy about Pearl Harbor. Frank Lloyd Wright's life is remembered by his wife and former associates. Wright, the architect, is represented in this tribute, narrated by Walter Cronkite. Walter Cronkite reviews astronaut John Glenn's first United States manned orbital flight. Walter Cronkite visits the Menninger Clinic in Topeka, Kansas, and talks with Dr. William Menninger and Dr. Karl Menninger about the past and present of psychiatry. Walter Cronkite narrates the history of the American and British suffragette from 1900 to 1920. Walter Cronkite narrated this documentary on the human factors that had to be considered in future space travel, seven years before Neil Armstrong actually landed on the moon. Walter Cronkite, who began anchoring the CBS Evening News only three and a half months prior to this newscast, reports on the death of Marilyn Monroe. By closed circuit television, he also discusses the tragic death with Kim Novak and signs off the air with his familiar "And That's The Way It Is Aug. 6th 1962." April 16, 1962-March 6, 1981. On April 16, 1962, Walter Cronkite replaced Douglas Edwards and became the anchor on "The CBS Evening News" which ran 15 minutes Monday thru Friday in primetime. The broadcast expanded to 30 minutes on September 2, 1963. Harry Reasoner anchors this live evening special program of the same day coverage of President John F. Kennedy's assassination. There is a special retrospective on JFK, the Kennedy family, the 1960 Election with interviews and remembered speeches. There are live late breaking bulletins from George Herman at the White House. There is a live editorial from Eric Sevareid on the late President. Dan Rather reports live from Dallas on the latest developments concerning Lee Harvey Oswald, who at this time was accused of only killing a policeman and who was currently being questioned. Live from Dallas police headquarters, KRLD-TV newsman Bill Mercer interviews policeman Jerry Hill, who has been questioning the accused Oswald. We hear Oswald denying that he shot the President. We hear CBS news correspondent Charles Von Fremd's 1960 interview with Kennedy who reflected on his views on the possibility of his own assassination. Harry Reasoner summarizes the days events and what is to follow. Lyndon B. Johnson addresses the American people in a brief recorded transcription - his first formal statement as President. Harry Reasoner continues with a profile on Johnson... past speeches, political statements and commentary from LBJ and Lady Bird Johnson. A past interview between Walter Cronkite and Lyndon Johnson is heard. White House correspondent George Herman comments on LBJ and there is a live statement concerning the JFK assassination from Adlai Stevenson. A special news report from the night of President John F. Kennedy's murder, this program is a review of John F. Kennedy's life, opening with scenes from his childhood, and continuing with his wedding and the Democratic National Convention of 1960. Includes excerpts from his first debate with Richard Nixon and his victory celebration in Hyannisport, followed by the inauguration. The 1961 Ottawa State visit, the Vienna Summit meeting with Khrushchev, and a Paris meeting with De Gaulle are recorded, followed by more family background, including an interview with Rose Kennedy and Jackie Kennedy, and a tribute to John F. Kennedy as a father. The Cuban crisis and the Berlin crisis are also reviewed. The program continues with President Kennedy addressing the nation on the Cuban missile crisis, followed by Kennedy's interview with three networks discussing the presidency. George Herman at the White House reports on the current news. A shot of Kennedy's Berlin reception in 1963, and his reaction to the murder of Medgar Evers are included, with clips of Kennedy on South Vietnam on the significance of the White House. Harry Reasoner discusses Kennedy's presidential image, and a clip of the inaugural address is seen. Dan Rather reports from Dallas, and Bill Mercer interviews a Dallas policeman. Herman at the White House and Reasoner report on current developments. Reasoner discusses Lyndon Johnson. The third hour of the program continues with a clip of Lady Bird Johnson and a flashback to the 1960 Democratic National Convention, followed by background on the election, concentrating on President Lyndon B. Johnson. Included are Johnson's around the world tour, and Cronkite's campaign interview with Johnson. The program continues with George Herman commenting on Johnson, and Johnson's return to Washington. Charles Kuralt reports on a high requiem mass in honor of John F. Kennedy in Los Angeles. The program closes with Harry Reasoner summarizing the day's events. This unscheduled special highlights past conversations with Truman, Eisenhower and Kennedy. Shown are Harry S. Truman interviewed by Edward R. Murrow in 1958, Dwight D. Eisenhower by Walter Cronkite in 1961, and John F. Kennedy by three correspondents including William H. Lawrence and Sander Vanocur in December of 1962. Moderator is Eric Sevareid. Reporters are Harry Reasoner and George Herman. President Lyndon B. Johnson is heard at the conclusion of the telecast. On Dec. 12, 1963, Alexander Kendrick reports on the phenomenon of The Beatles who have yet to come to America. Their appearance on the "Ed Sullivan Show" took place Feb. 9, 1964. Walter Cronkite anchors this flashback news report on the Dec. 19, 1980 edition of the CBS Evening News. On the day of his death at age 90, a special report on Sir Winston Churchill. There is a tribute from Dwight D. Eisenhower. Almost the entire debut presentation from the nine year running series Twentieth Century is rebroadcast. That first program, "Winston Churchill: Man of the Century," aired on Oct. 20, 1957 and as all programs, was narrated by Walter Cronkite. Robert Trout introduces this special report. Eric Sevareid gives commentary. A special report on the friends of Sir Winston Churchill who knew him well including Dwight David Eisenhower, who is interviewed by Walter Cronkite and Lord General Ismay, who was interviewed by Edward R. Murrow in 1960 and broadcast now for the first time. Live coverage by both CBS and NBC of the Gemini IV spaceflight with astronauts Edward White, and James McDivitt aboard. Walter Cronkite narrates this history of lighter-than-air-crafts-balloons, blimps and promising but ill-starred dirigibles of the thirties. Walter Cronkite narrates the opening dozen minutes of this special profile on Frank Sinatra. Walter Cronkite, Rod Serling, Howard K. Smith, Herbert Arkin, John Schneider, Thomas Moore, Larry Laurent, Pat Weaver, Mike Dann, Ed Scherick, A.C. Nielsen Jr.
Members of the television industry and their critics offer their views on the medium and its future. 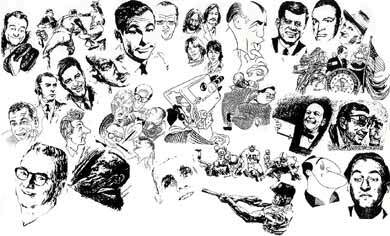 Round table discussions with A.C. Nielsen Jr., Walter Cronkite, Herbert Arkin, Howard K. Smith, John Schneider, Thomas Moore, Larry Laurent, Pat Weaver, Mike Dann, Ed Scherick and Rod Serling. Walter Cronkite reports on the validity of Flying Saucers. #7812: CBS NEWS SPECIAL: "PEACE, POLITICS, AND PRESIDENT." A CBS News special report with host Walter Cronkite. The topic is President Lyndon Baines Johnson's decision not to seek re-election and on the prospects for peace in Viet Nam. #1046: ASSASSINATION OF DR. MARTIN LUTHER KING JR.
News report of the assassination of Dr. Martin Luther King Jr. from WTOP-TV(CBS) Washington D.C. by Julian Barber. There is an NBC News bulletin and special report with further details including news of King's death. An ABC bulletin is heard interrupting regular broadcasting, announcing the tragic death of Dr. Martin Luther King Jr. Joined in progress, late reports from Dan Rather on a CBS News Special Report. In a previous speech King is heard, reminding his followers that to put one's life on the line for what is just and righteous is to place oneself in danger, but the risks must be taken. Another CBS News Special report is telecast. Walter Cronkite relays the latest news from Memphis, Tennessee where King was pronounced dead one hour after he was shot. Cronkite recounts a brief biographic report on King; his early life, his rise to fame, and the influences he has had promoting non-violent activites. Wires are read from shocked dignitaries. President Lyndon B. Johnson speaks live to the American people requesting all Americans to work together for peace and solidarity. Via video tape, Vice President Hubert Humphrey reflects on this tragedy and gives praise to the work which King has done and to his non-violent philosophy for acquiring freedom and civil rights for all people. On the following day, April 5, Dan Rather reports concerning the looting which has occured. CBS Evening News with Walter Cronkite reports on the state of emergency in Washington D.C. where racial violence has broken out. Steve Rowan reports. A national day of mourning is reported by Dan Rather. President Johnson again talks to the American people requesting unity. Additional reports from Memphis come from Ike Pappas and from Bill Plante. Prayers from Dr. Ralph Abernathy are heard. From Atlanta, a report detailing the return of King's body to Georgia. Peter Burns reports on funeral arrangements. From Cleveland, John Hart reports; we hear statements from Senator Robert F. Kennedy and Carl Stokes. From the Huntley Brinkley Report (NBC), Chet Huntley and David Brinkley inform on the latest development regarding violence in many states including Detroit, Greensboro, and Chicago. CBS coverage with anchorman Walter Cronkite. Morton Dean talks with Presidential candidate Richard M. Nixon on the floor of the convention. Nixon gives a 39 min. acceptance speech to the convention. Rev. Billy Graham gives the final benediction. The convention is adjourned. Eric Sevareid gives his analysis of Nixon and his acceptance speech. Roger Mudd gives his own analysis of Nixon. Walter Cronkite and Mike Wallace join in discussion. Wallace traces Nixon's climb to his present popularity. There is a replay segment of a 1962 news conference - the morning after his defeat for California Governor to Pat Brown and his famous statement to the press, "You won't have Nixon to kick around anymore, because gentlemen, this is my last press conference." There is also a replay segment of Nixon's introduction speech at the 1964 Republican convention and a Sept. 1966 "Face the Nation" appearance. John Sears, Nixon's aid, comments. There is additional analysis of political events and maneuvers which catapulted Nixon to the head of the Republican Party through his 1968 primaries. Julie Nixon is heard campaigning. Nixon aids discuss campaign strategy. Nixon news media discussion at his hotel and more. Walter Cronkite gives his thoughts and wraps up the broadcast. Merv Griffin welcomes Walter Cronkite who reminisces about his personal & professional life and his broadcasting career. David Frost interviews Walter Cronkite who discusses many topics including the unique Apollo XI moon landing which occured two months prior on July 20, 1969. April 16, 1962 - March 6, 1981. On April 16, 1962, Walter Cronkite replaced Douglas Edwards and became the anchor on "The CBS Evening News" which ran 15 minutes Monday thru Friday in prime time. The broadcast expanded to 30 minutes on September 2, 1963. Former President Lyndon B. Johnson reviews some of the events surrounding the assassination of President John F. Kennedy. Walter Cronkite conducts the interview at the LBJ Ranch in Texas. Walter Cronkite and Charles Kuralt report on the death of Louis Armstrong. Walter Cronkite reports on this the last USA manned moon landing to date. Walter Cronkite reports on the day's events in the news. Commercials included.